If you are looking for a quick and easy meal to throw together that will taste gorgeous, then look no further. 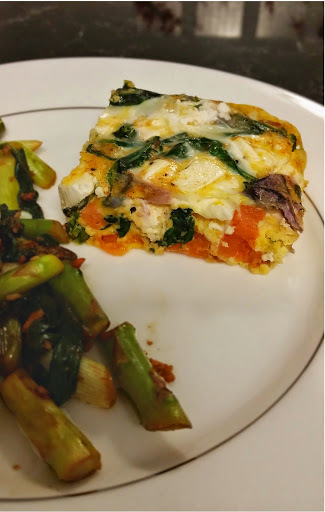 We’ve had too many eggs so I wanted a yummy main to use some of them up, as well as some other veggies I had in my fridge. This balance of flavours is absolutely lovely. The sage and the sweet potato make the dish hearty, the feta adds some tartness, red onion adds a peppery kick and the cayenne pepper brings a little spice to the table. We used about double the amount of cayenne pepper than I’ve listed in the recipe because we just love spice. This fed the two of us for three nights with side veggies or salad (pictured above with a side of quickly stir fried spring onion, asparagus, garlic and wilted spinach topped with a squeeze of lemon juice…nom). Frittatas are great because they are so versatile. Of course you can add any meat you please to this recipe, and swap out any old combo of veggies and herbs. Any number of combos would work. Of course you can always swap the milk for cream to make it more decadent. Bring a saucepan of water to boil, salt and cook sweet potatoes until soft, then drain. Meanwhile pan fry asparagus and spinach until asparagus has greened and spinach has wilted. Use a Spray olive oil to coat the tray or line the tray with baking paper. 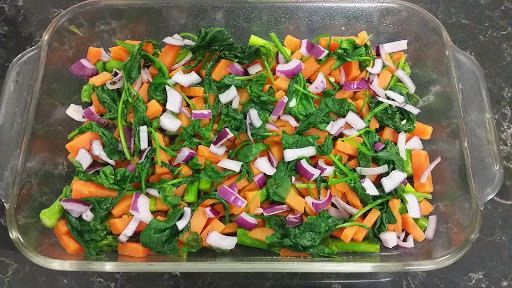 Layer the vegetables in the base of the tray. Mmm – fresh colourful and healthy! 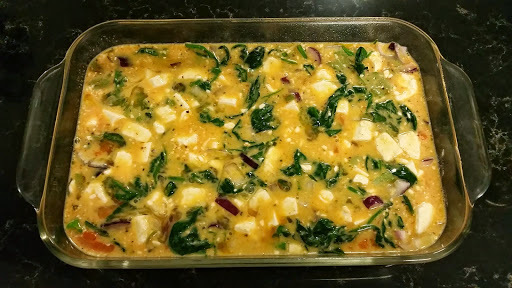 Mix together the eggs, milk, feta, cayenne pepper, sage, salt and pepper. Bake for approximately 30 mins or until cooked through. Serve with a nice side salad or vegetables. If the top is too brown, it has been overcooked. It should be cooked all the way through but not hard. 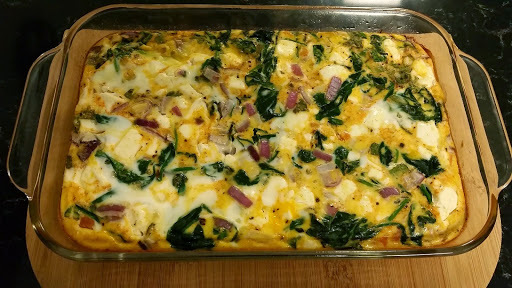 A good frittata should have a bit of creaminess to it in my opinion. We were really happy with this meal. It was economical and satisfying. It would make a great option for using up any leftover veggies that you have in the house. Plus it is good to eat vegetarian at least one night a week. We have made this a couple of times now, and will definately make it again!